The front page coverage of the 13 newspapers studied here tended to portray a more extreme version of the overall press treatment of both McCain and Obama. Coverage was more critical of John McCain and more favorable toward Barack Obama than the media overall. When it came to Sarah Palin, it was somewhat more neutral, and less positive. Indeed, of all the media sectors studied, John McCain received the most negative coverage in print. In all, 69% of the newspaper stories studied about McCain were clearly negative, while only 6% were positive, a ratio of about 11-to-1. (The press overall was 57% to 14%, a ratio of closer to 4-to-1.) Only MSNBC offered more negative coverage of the Republican nominee. 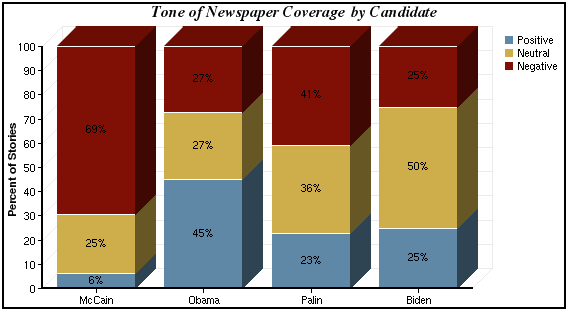 Newspaper front page coverage was also the place where we found the most positive coverage for Obama of any sector studied, though the level of negative coverage was fairly typical. Almost half (45%) of the newspapers stories about Obama were positive, compared with 36% in the media generally. Most of that difference came from fewer neutral stories—just 27% versus 35% in the media overall. Negative coverage was more similar, 27% versus 29% overall. In short, newspaper front page stories about both presidential candidates tended to be more analytical than elsewhere in the media, perhaps in part because of their length, and that redounded to Obama’s benefit and McCain’s disadvantage. This tendency toward analysis in print political coverage had less impact on Palin. Among front page stories where Palin was a significant presence, 23% were positive, compared with 28% in the media generally. And 41% of front page Palin stories were negative, roughly similar to the 39% generally. As for Biden, the little coverage that he received was balanced evenly between positive and negative stories (25% positive, 50% neutral, and 25% negative). This was somewhat less negative than the coverage he received overall at 32% negative. For both candidates, much of the tonal balance seemed connected to coverage of the horserace rather than more policy-oriented pieces. Fully 76% of the stories where McCain was a significant presence were focused on the horserace aspect of the campaign, and of those, only 5% were positive while 73% were negative. Similarly, Obama fared better in the newspaper horserace stories than he did in newspaper stories overall. More than half of the horse race stories (53%) about Obama were positive, which was higher than the 45% of positive coverage he received in all newspaper stories and the 36% positive coverage he received in all media. There were some subtle differences in the subject matter on newspaper front pages. While the percentage of coverage devoted to the horserace was similar to that of the media overall (52% vs. 53% overall), newspapers stood out for devoting a larger portion of their front-page newshole to personal storylines and less to policy. In the front pages studied, 9% of the coverage dealt with personal issues about the candidates, more than any other media sector and nearly double that of the media overall (5%). Newspapers, in turn, devoted less space to policy stories than any other media sector during these six weeks of the general election period. Policy coverage made up 13% of newspaper stories compared to 20% of all campaign coverage in all outlets. Part of the difference in policy coverage may be tied to the in-depth profiles of candidates that the newspapers ran. The second- and third-biggest storylines covered by newspapers during this time period were directly related to the backgrounds of the GOP candidates. For example, on October 5, the Washington Post ran a 4,700 word story on John McCain’s experience in Vietnam and how that ordeal has shaped his worldview. The Post ran another lengthy piece on McCain a week later which focused on the idea that he began conceiving his desire to be president while in the P.O.W. camp in Vietnam and how his cellmates ridiculed him at the time for it.